This recipe will show you how to cook cod and just how easy it is to prepare. It’s packed with fresh, bright and crisp flavor without being packed with complicated instructions. Preheat oven to 350F. Combine first 6 ingredients in small bowl and set aside. Lightly oil 8” baking pan. 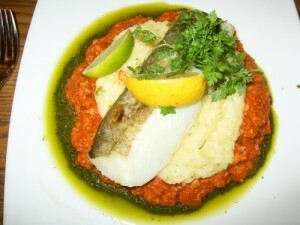 Place in cod fillets – top with garlic and 1/3 of the sauce. Bake 15 minutes. Serve with remaining sauce. Cod is traditionally used in fish and chips, but this is a super healthy and fresh alternative! Cod is a great source of protein, omega 3 fatty acids and loaded with vitamins! Serve with your favorite steamed vegetable and a crisp white wine – definitely save the red for later!